As beers from all over the world crowd the shelves, it’s tough to stand out. Your beer might have the quality ingredients, but if you don’t have the winning typography or graphic spark, your bottle with the sunset might get passed over for the can with the leaping pigs bumping bellies. Part commercial art/part fine art, beer labels merge with the beer-drinking experience. Mega-breweries have known this for generations: you can’t separate Coors from its Rocky Mountains or Budweiser from its eagles and coat of arms. By comparison, craft breweries are just as creative outside the bottle as in. From splashy, bold logos to arresting illustrations and photographs, these labels grab your attention and even tell a short story. 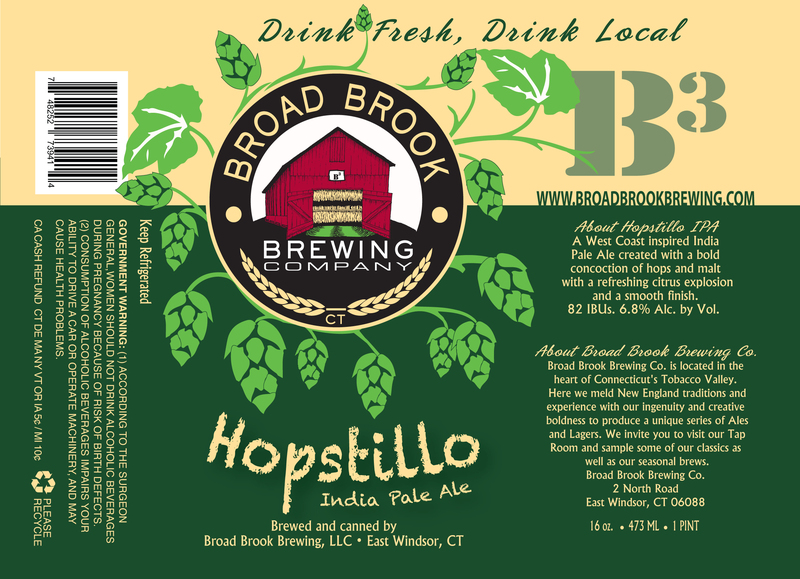 To delve into the world of beer labels, I talked to the authors of a new book on the topic, as well as some local artists whose work appears on Connecticut bottles and cans. 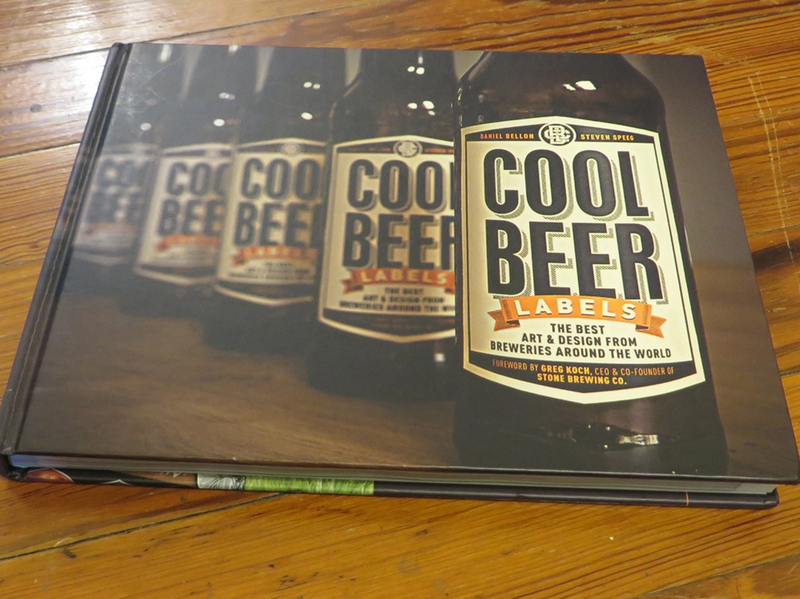 To get an overview of the industry, I turned to “Cool Beer Labels: The Best Art & Design from Breweries Around the World” (Print Books, 2014), from Wallingford co-author Steven Speeg and Pittsburgh-based co-author Daniel Bellon. It’s a mix of stunning photography and insightful commentary from a designer’s perspective. It covers smaller U.S. breweries in geographic chapters. Speeg writes about breweries on the East and West coasts, while Bellon focuses on the Midwestern, Southern and international breweries. Their profiles focus on the breweries, but go deeper into the packaging. Their interviews with the designers (sometimes in-house, sometimes from design firms) and brewery owners include those from BLINDTIGER Design in Seattle, Wash.; Sixpoint Brewery in Brooklyn, N.Y.; Brew Dog in Scotland; and 8 Wired Brewing in New Zealand. Beer label design is a bit like album design, Speeg said, drawing a parallel between buying a bottle for the imagery and taking a chance on a CD for the same reason. When it comes to creating the images that inspire the purchase, I turned to Craig Gilbert, whose work appears on many of New England Brewing Company’s cans. Gilbert — an artist, author and reiki teacher – has been involved with NEBCO since it opened in Woodbridge more than 10 years ago. He’s been friends with owner Rob Leonard since they were kids and started home brewing with Leonard back in the 1980s. Gilbert, whose work can be found at www.thatcraigguy.com, helps invent beer names as well. 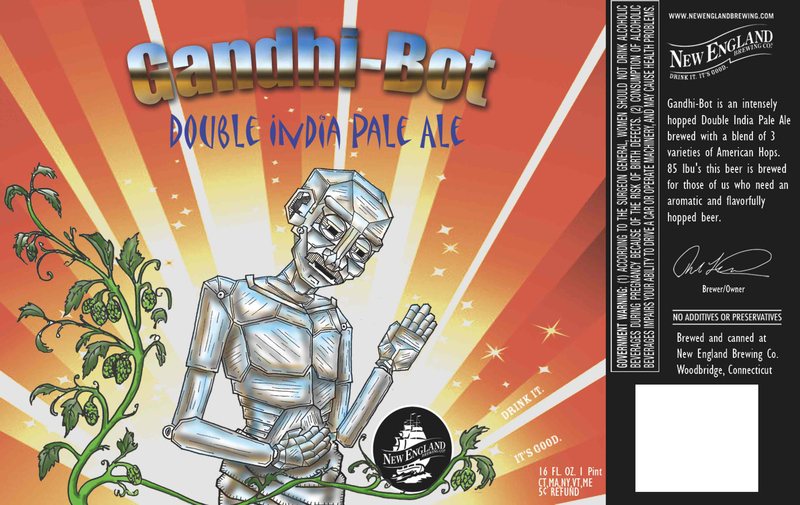 Probably the name that’s on the most amount of beer lover’s lips is Gandhi -Bot, the celebrated double India Pale Ale that features, well, a robotic version of Mahatma Gandhi. There is at least one person in the world that made Gandhi-Bot a permanent part of their lives: Gilbert said it was a proud moment indeed when he saw his first Gandhi-Bot tattoo on a fan. 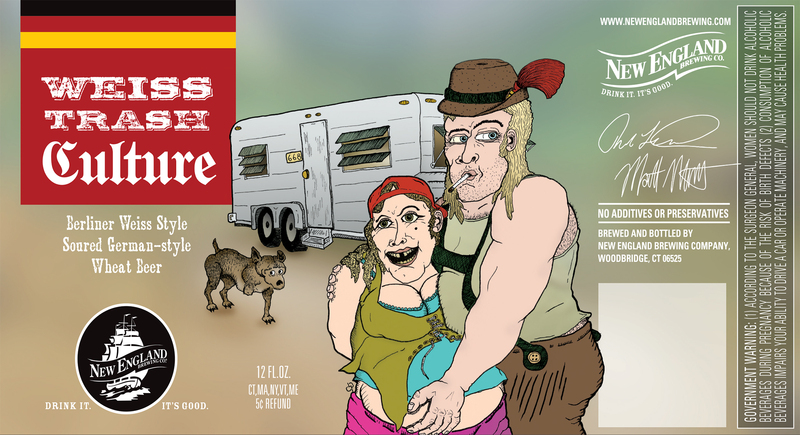 My favorite Gilbert creation is his darkly comic illustration for Weiss Trash Culture, for New England’s mildly sour Berlinerweiss. It features a very pregnant woman cradled by her cigarette-smoking, mulleted beaux, in front of a trailer (subtly addressed “668”) near a three-legged dog. Speeg pointed out that a new trend in beer labels is allowing local artists to personalize each new brand of beer, instead of sticking with a similar look. 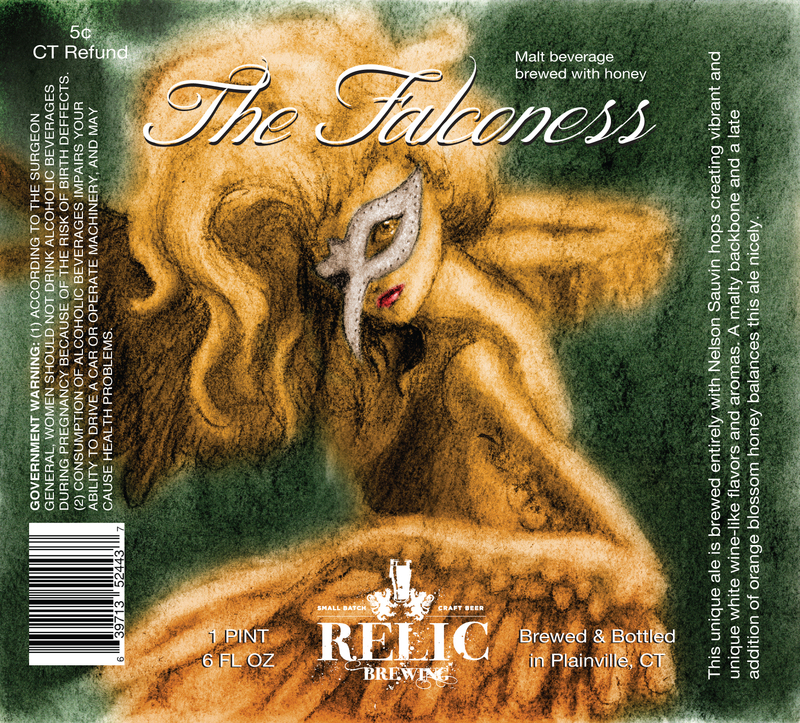 That’s what Relic Brewing of Plainville has decided to do, and it has some of the most haunting and exotic labels in the state. One of the artists commissioned to create Relic labels is Samela Aguirre, a graduate of the Hartford Art School who now lives on Long Island. Aguirre has created two aesthetically different labels for Relic. 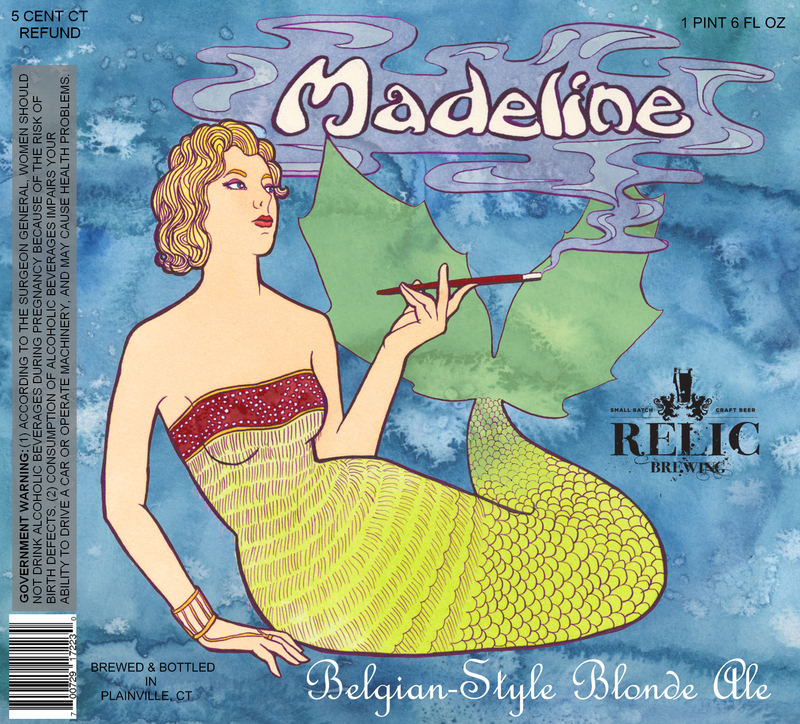 One, for Madeline – a Belgian-style blonde ale – features watercolor and an inked drawing of an aloof mermaid casually smoking a cigarette from a long holder. The other, for The Falconess, is much more ephemeral, but also features a strong heroine: this one is winged and masked for a costume ball. 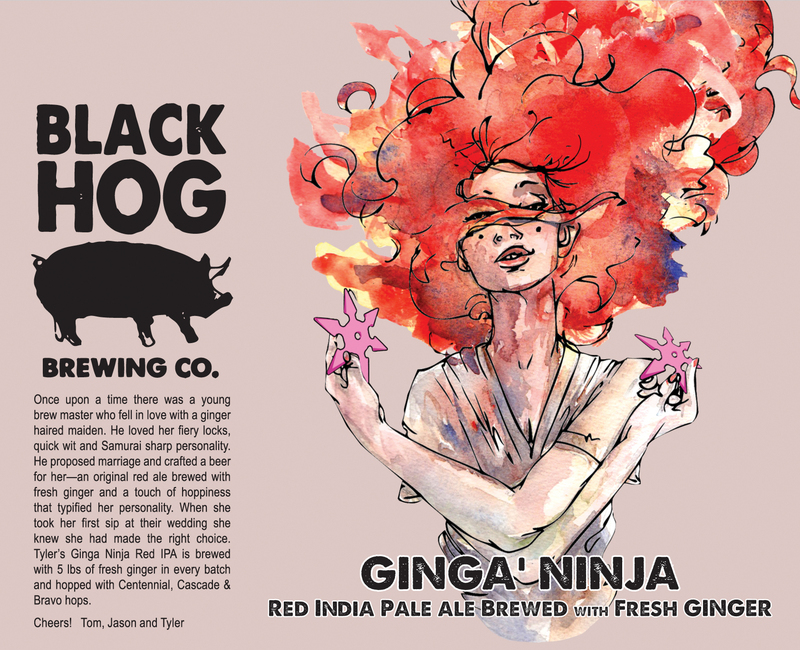 One of the newest breweries in the state, Black Hog of Oxford, hasn’t gotten into canning yet, but that hasn’t stopped them from creating the imagery for its first beers. When the partnership of owners wanted a look that fit their style, they turned to painter Maximilian Toth of New Haven (www.maximiliantoth.com). He’s created splashy, playful labels. The most arresting is the one for Ginga’ Ninja, a red India pale ale made with fresh ginger. It’s of a beautiful, pale redheaded woman poised to double-toss some deadly throwing stars. Another, for Easy Rye ‘Da, is a portrait of a co-owner Jason Sobocinski’s 1964 Honda Superhawk. 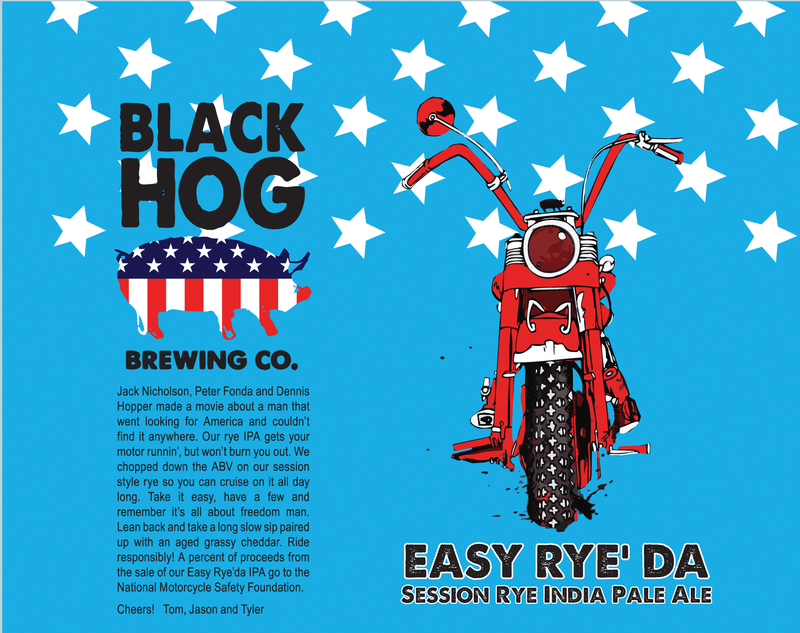 Toth said the “Black Hog style” is a mix of his own handiwork and the tastes of brewer Tyler Jones and brothers Jason and Tom Sobocinski. There are standards for commercial art that simply don’t apply when it comes to the freedom of a gallery. That hasn’t stood in the way of Toth getting his vision across, whether it’s a frightening pig head with a grapefruit in its mouth (for Black Hog S.W.A.G.) or the silhouette of a hiker for Granola Brown Ale. From talking to designers, I’ve gained a new appreciation for the form, and will be giving a little extra attention to the details of my next six-pack. We owe a debt of gratitude to the men and women who add that extra layer of artistry to an industry already overflowing with talent. A shorter version of this column was originally published in the Waterbury (Conn.) Republican-American on Nov. 12, 2014. ← Enough with the pumpkin beer, already! Cool idea for a column! I always buy wine by the price range and picture on the label, b/c I really don’t know what I’m buying… But beer labels influence me as well. I think it was Weyerbacher’s label for Old Heathen that got me into imperial stouts many years ago — a druid-looking figure on top of a hill in the nighttime. I once read an article saying that Weyerbacher had a “terrible” logo and labels, but it sure sold me!